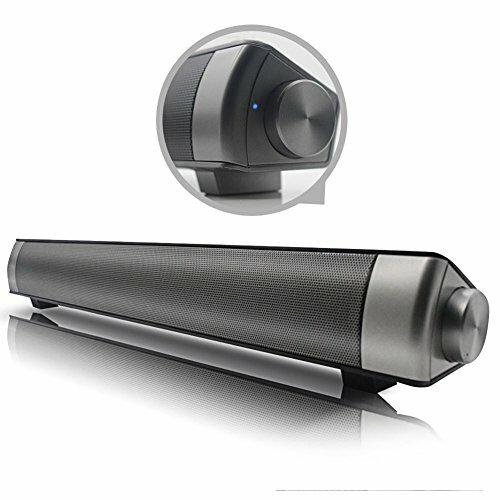 Portable Stereo Super Bass Sound Bar Bluetooth Speaker Wireless Subwoofer Computer PC TV Soundbar,Perfect gifts for yourself or your friends.The Speaker Suitable for playing indoor,outdoor sports,stage,meeting occasions and so on. Let you enjoy your favorite music in high-quality sound.Allows you to stream music from any Bluetooth enabled devices such as cell phones, laptops, tablets and other Bluetooth deceives. Offers a wireless connection range of 10 meters.Convenient buttons for music and call control, built in Mic.Powered by built-in rechargeable battery (charged by USB cord included). Wireless Bluetooth Connection and 3.5mm Standard AUX Input.Support TF Card Music Play.Built in Led book light for lighting. Compatible with all of devices which have the Bluetooth Function, such as Tablet PC, Laptop, PSP, TV, Computer, etc.